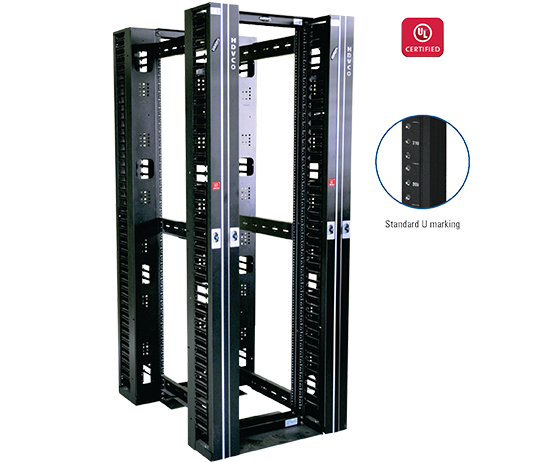 NAOR - 4 Post Series are Ultra rigid Racks for high density application for networking / labs / data Centres. These Racks are made of rugged aluminum profiles, individually powder coated and bolted with highest quality standards under stringent ISO 9001-2008 Manufacturing & Quality management system. Standard for Racks configuration will be bolted frame with 4 Post. 4 Post will have adjustable Steel folded depth members to adjust the depth to meet site requirements. Available in 22RU~52U variants.